Thank you for downloading the “CL StageMix” iPad app for the Yamaha CL series digital mixing consoles. 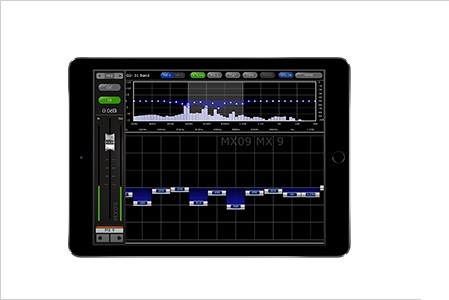 StageMix is an application for the Apple iPad that provides remote control of Yamaha CL series digital mixing console functions via a simple, intuitive graphical interface from anywhere within wireless range. The software has been specifically designed to allow engineers to adjust monitor mixes from the performers’ positions on stage, directly controlling mix parameters via the iPad rather than having to rely on verbal directions to a second engineer. The result is better mixes in less time; a huge advantage during high-pressure pre-show setup. Although StageMix is focused on the requirements for adjusting monitor mixes on stage, its range of features is continually expanding, allowing it to be used for a wider variety of remote control functions. Note: iOS applications may not be supported in your area. Please check with your Yamaha dealer. Select the wireless mode (802.11g, n or ac). If available, enable “Auto Channel Selection” so the wireless channel with the least interference will be selected. Using a Wi-Fi access point with 2 or more external aerials is recommended to increase potential signal range. Booster aerials could be connected for a further increase in performance. Connect the Wi-Fi access point to the CL series console’s network port via a CAT5 cable. Make sure your Ethernet cable is connected to a LAN port on your Wi-Fi device and not the WAN port. Dynamic Host Configuration Protocol (DHCP) is a network protocol that enables a server to automatically assign an IP address to a device. It is recommended to use DHCP. Use the following steps to configure your iPad using DHCP. Tap on the network’s name to edit the IP address. Select [DHCP] and ensure that your iPad receives data for the IP Address, Subnet Mask, Router and DNS. Select [Renew Lease] if this data is not applied. If the settings are successfully applied, press the iPad’s Home button to exit the Settings menu. Make sure that the subnet of the IP address is the same as that of the CL series console. If DHCP settings are not applied after step (e), please check your DHCP server settings (refer to 11.4 for further advice). Alternatively, setup your iPad using a Static IP Address. IP Address: enter an IP Address similar to the one for the CL series console, but with just the last number different. (For example, if CL series console is 192.168.0.128, give an address to the iPad such as 192.168.0.124). Press the iPad’s Home button to exit the Settings menu. If using iOS 9.3 and later with CL StageMix V7.0 and later, you can connect to a network using a wired connection in addition to a wireless connection. A Lightning to USB 3 Camera Adapter and USB Ethernet Adapter are required to use a wired connection. You can switch between a wireless and wired connection when offline; you cannot switch while online. Access the OFFLINE DEMO mode to explore the features and user interface of CL StageMix. Configure StageMix to work with a CL console. 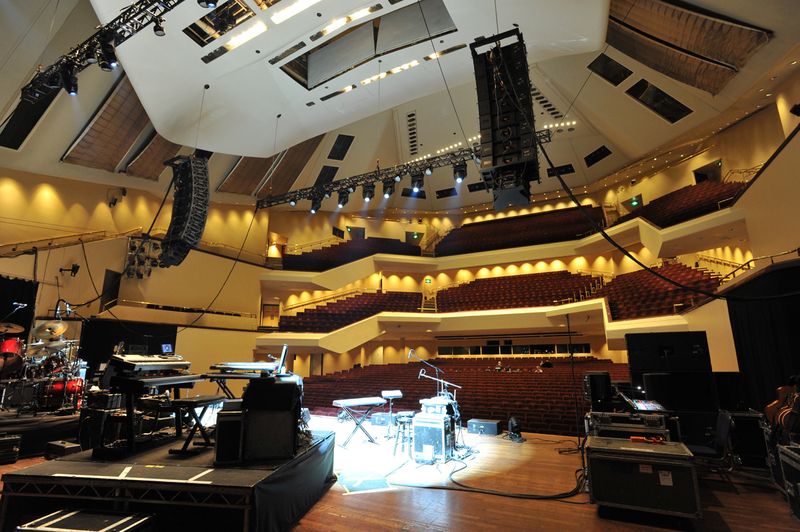 Select a CL console that has already been configured to work with your iPad and begin using StageMix. If [OFFLINE DEMO] is pressed in the “Select Mixer” screen, the functions of StageMix will operate independently of any mixing console. It is a useful way to demonstrate and learn how to use the app without the need for a mixer. Level meters and most Scene Memory functions do not work in this mode. Tap on the blank Name field and enter a name for your CL series console using the iPad’s onscreen keyboard. Enter the CL series console’s IP address noted in 3.1. The default IP Address may not need to be changed but confirm this in the Network Setup screen of the CL series console (refer to 3.1). If you need to modify the IP Address in StageMix, make sure you include the dots between the sets of numbers (as shown above). If the entered console IP address is in a compatible range with the iPad’s current IP address (displayed beneath), a green tick will be displayed to the right of the console IP address. If the entered IP address is in-compatible range with the current IP address of the iPad, a red cross is displayed – please enter a console IP address in a compatible range. Please note, having a green tick displayed does not mean that the entered console IP address for the console is accurate or that the console has been automatically detected. Please check the console for the currently assigned IP address to ensure that the correct address is being entered into StageMix. Select the Model of CL series console. Press the [ADD MIXER] button at the bottom of the screen. For reference, the currently assigned IP address of the iPad is displayed beneath the console model buttons. Note: From StageMix V6 onwards, it is no longer necessary to enter the console MAC Address. Click the [CONNECT] button to connect to the console and begin the synchronization process. The message “Syncing With CL…” will appear while StageMix is obtaining parameters from the console. After this process is complete, the Mixer window will appear and StageMix is ready to be used. Up to 5 iPads running StageMix can be connected to the console simultaneously. If StageMix cannot connect with your console, refer to the Troubleshooting section (11.0) at the end of this document for possible solutions. 3.3.2. After editing, press [SAVE MIXER] to save any changes. The main page of the StageMix is called the “Mixer” window. It shows the EQ curves, Pan positions, Dynamics status, [CUE] and [ON] buttons, faders, level meters, and channel names and colors for eight adjacent channels. Across the top of the screen, level meters and faders are displayed in blocks of channels for mono Input Channels 1-32, Stereo Input Channels 1-8, Mix and Matrix busses, and the Master Stereo and Mono busses. This is the “Navigation/Meter Bridge”. From StageMix Version 7, there is a new option in the Navigation/Meter Bridge to access the “Custom Fader Layer” view. Refer to section 4.2.1 for details. Press any of the “Navigation/Meter Bridge” blocks to select the bank of channels to be viewed and controlled in the channel strips below. Press the [CH 1-32] or [CH 33-72] button to make those banks of channels available in the “Navigation/Meter Bridge”. Stereo Inputs 1-8 are available as part of the [CH 1-32] bank. The Layer Navigation button displays black text on a white background to indicate the active Layer. Press the [CUSTOM] button in the meter bridge to access the Custom Meter Bridge layout. To assign a fader bank to a meter bridge block, touch and hold on a fader/meter block. An assignment pop-up menu will be displayed which contains a list of all available fader banks for the connected console model, including all standard fader banks, DCA banks and Custom Fader Banks. Touch the desired fader bank to assign it to the chosen fader block. Repeat this operation to assign multiple fader banks to the available meter bridge blocks. Left/Right navigation buttons can be used to navigate to other meter blocks without leaving the assignment pop-up. To exit the assignment pop-up, touch anywhere outside of the pop-up or touch the close button in the top right corner. On the far-right side, is the master block. This block can be assigned as either the standard master bank (as found in the standard meter bridge in StageMix), or as the custom master bank as set on the console. Please note, it is not possible to edit Custom Fader Bank channel assignments from StageMix. Please use the Console or CL Editor for this function. Once a fader bank has been assign to a meter bridge block, a name can be given to the bank. Double tap on the desired fader bank in the meter bridge to open the keyboard. Once a name has been applied, press [return] to close the keyboard. Alternatively, use the left/right arrow keys to move to other banks along the meter bridge, to name those banks without having to close the keyboard and re-select the next block. The bank name is now displayed under the applicable fader block in the meter bridge. The name is linked to the chosen fader bank, not the block position in the meter bridge. If a named fader bank is changed to a different meter bridge block location, the name of that bank will automatically follow. Please note, in order to name a fader bank it is first necessary to assign it to the meter bridge. The assigned custom meter bridge fader bank layout and naming’s, are stored as part of the currently in-use Mixer Preset – as created in the front page of StageMix. If a Mixer Preset is deleted or the console model is edited, the associated layout and naming’s will also be deleted. The name and color of each channel appears in StageMix as it does in the CL series console. The names are dimmed if the channel is switched off. Double-tap on the channel name in the Mixer window to edit the name and color. Type in a name and press [return]. Alternatively, navigate to another channel using the left/right cursor buttons above the keyboard. This allows multiple channels to be named before closing the keyboard. Each fader has its channel number displayed on its cap. The fader cap must be touched to allow the level to be adjusted. When a fader cap is touched, its background will lighten and its current dB value will be displayed. Using the iPad’s multi-touch facility, up to eight faders can be moved simultaneously. Note: “Multitasking Gestures” must be turned Off in the iPad in order to allow four or more faders to be adjusted simultaneously (refer to 11.8 for details). Press the [LONG FADERS] button at the bottom-left corner of the Mixer window to allow more accurate adjustment of fader levels. In this view, EQ, Pan, Dynamics and the “Navigation/Meter Bridge” are not visible. Although the “Navigation/Meter Bridge” is not visible in Long Faders mode, it is possible to navigate up or down in banks of 8 channels using the left/right arrow buttons in the upper left area of the Mixer window. Press the [LONG FADERS] button in the bottom-left corner again to return to the Mixer Overview. Press [ON] to change the on/off status of the channel. The button is green when the channel is on. When a channel is off, its name and level meter will dim and its fader position shown in the “Navigation/Meter Bridge” will also dim. The [CUE] buttons for each channel control the mixer’s Cue functions. Their operation mode corresponds to the status of the Cue Mode in the Setup screen (refer to 10.10). When [LAST CUE] mode is active, only one channel can be cued at a time. When [MIX CUE] mode is selected, multiple channels can be cued simultaneously. The [CUE CLEAR] button will cancel any cues that have been activated. This is useful when there are multiple cues to cancel, and when some are hidden in other layers. With V4 firmware and higher, a second cue bus (Cue B) can be created using Matrix 7/8. This assignment can be made in the console only. If a Cue for a channel is active, the Cue button will be yellow. In Remote mode, Cue functions in StageMix will exclusively control the Cue B Bus. If the [CUE CLEAR] button is pressed, the Cue B Bus will be cleared. When SOLO mode is ON, the [CUE] buttons in StageMix change to [SOLO] buttons. These buttons turn red when they are enabled. Note: this does not apply if Remote mode is also active. SOLO mode effectively operates in addition to Cue mode. When a channel is Soloed, it is also Cued. If Remote mode and SOLO mode are both active, StageMix will control the Cue B Bus and Solos will be accessible from the console only. If SOLO mode is used along with Dual Cue Channel Mode, the [SOLO] buttons will also include A and B indicators to identify their Cue bus assignments. Pressing the [Master] block in the “Navigation/Meter Bridge” will cause channels from the master section to appear in the fader strips. Included in this block are the Stereo Master channel, Mono Master channel and the Monitor Level and On control. Note: there are two EQ thumbnails above the Stereo Master channel. Parametric EQ is always linked for the left and right sides of the Stereo Master channel. However it is possible to have independent GEQs assigned to the left and right side of the Stereo Master. The gain for each input channel can be controlled using the faders in StageMix. Press the [GAIN] button in the lower left area of the Mixer window to enter GAIN mode. Note: the [GAIN] button will only appear when a bank of Input Channels is selected since there are no Gain parameters for Output Channels. Input channels can have both Analog and Digital Gain parameters. When GAIN mode is selected, a second button labelled [DIGITAL] appears above the [GAIN] button. If the [DIGITAL] button is not highlighted, then Analog Gain mode is active. The background behind the channel faders will be dark red to indicate that StageMix is in Analog Gain control mode.